They did it! The 2015-16 Stanley Cup Champions are your Pittsburgh Penguins. Over the past two years, this has been all too familiar. The New York Rangers would usually not only best the Penguins in the regular season, but get them in the playoffs as well. They eliminated the Penguins in 7 games in the 2013-14 season, and subsequently eliminated them in 5 games in the 2014-15 season. As we ended the 2015-16 regular season, both the New York Islanders and the New York Rangers were intentionally making an attempt to lose games so they could face the Florida Panthers in round one, and not the red hot Penguins. Eventually, it came down to a third straight year of playoff contention between the Penguins and the Rangers. If recent history meant anything, the Rangers would somehow come out on top. Well, Barry Melrose ended up being wrong (which wasn't the first time he was this year, and it certainly wouldn't have been the last) as the Penguins stormed past the Rangers in 5 games, finally exacting revenge on their Metropolitan rivals after two years of playoff disappointment. If you had to define secondary scoring, it would likely be something along the lines of production from your 3rd and 4th lines, and maybe some help from the defense. In the past years, the Penguins had nobody who could chip in from those lines, and would usually have to rely on the Sidney Crosby and Evgeni Malkin lines for scoring. Not this time! This year, the third line (Carl Hagelin, Nick Bonino and Phil Kessel (The "HBK Line")) combined for 20 goals and 52 points through these playoffs! The fourth line (Tom Kuhnhackl, Matt Cullen and Eric Fehr) combined for 9 goals and 15 points. Usually the fourth line was littered with 'goons' and 'enforcers' like Tanner Glass, Maxim Lapierre, Zach Sill (et cetera) but this year, it was drenched with skill and oozed with speed. Sure the Penguins were usually outhit, but that usually means the Penguins had the puck more. To follow the previous narrative, something that was usually said in past playoff years was the great Sidney Crosby would disappear come playoff time, and would not contribute (on the scoresheet) to any hope of the Penguins hoping to dance with Lord Stanley. Well, that was anything but the case this year. This playoff year, Sidney Crosby scored 6 goals and 13 assists for 19 points. But that's not even the best part. Through the playoffs, Sid had a CF60 of 67.4 in 5v5 situations! That is an insane average to sustain, especially through playoff teams. It goes to show how much of a monster Sid was on the puck, and how he can control a play if he wants to. There was no doubt he was deserving of the Conn Smythe trophy, and people who argued he was not deserving are likely stuck on the +/- stat. The defense was spectacular all playoff long. Not only did they do their jobs of simply helping their goalie and getting the puck to their forwards, they did that and more! From the collective of Kris Letang, Ian Cole, Brian Dumoulin, Ben Lovejoy, Justin Schultz, Olli Maatta, Trevor Daley and Derrick Pouliot, 9 goals were scored and 40 points were recorded through the playoffs. Incredible! Kris Letang was an absolute workhorse, but when isn't he? Brian Dumoulin showed promise last year and came through this year (including the first goal in game 6 of the Stanley Cup Final), and is an extremely underrated piece of this team. Trevor Daley ate up minutes during a Kris Letang suspension and helped the Penguins win in that very game. Olli Maatta faltered at first (we can all suspect he's hurt in some way), but after he came back from being benched he passed with flying colors, coming back in ways you'd not expect. Justin Schultz, Ian Cole and Derrick Pouliot all played on the third line of defense (Pouliot for just 2 games), but they were reliable when needed. The biggest surprise is no doubt, one Ben "The Reverend" Lovejoy. During these playoffs, Lovejoy had a CF% of 48.55. That isn't good, but for the reputation Lovejoy's play has gathered through this year, it certainly isn't bad! Through and through, the defense of the Penguins showed close to no weaknesses, and was littered with speed and skill. No goonery or 'enforcer' types this year. Other narratives written about these Penguins in past years were debunked, but these were the biggest. And what did that get the city of Pittsburgh? Lord Stanley's Cup. 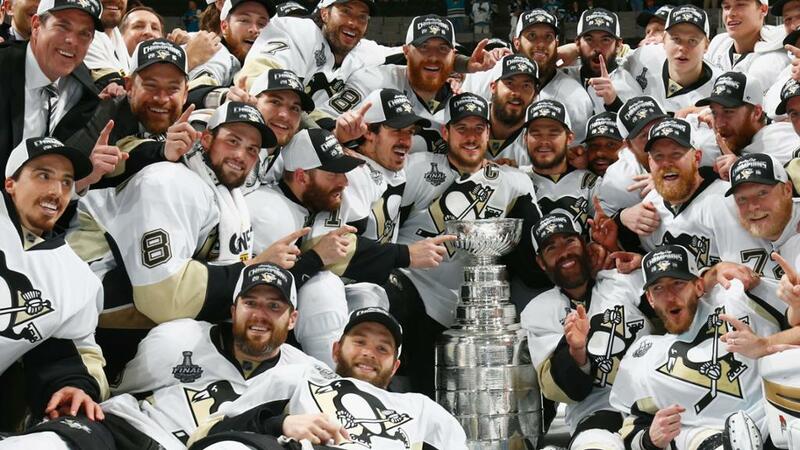 Enjoy it, Pens fans.